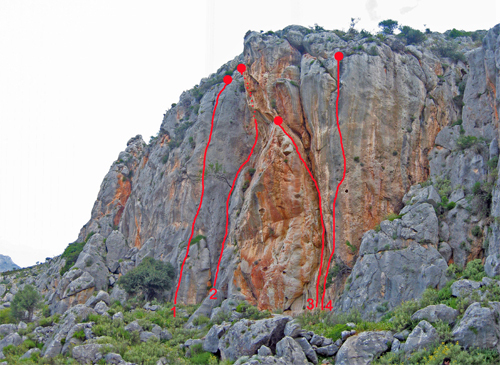 At last Aris Theoderopoulos has got it together to write this area up and also give the locals a push to start bolting so plenty of new stuff here, and of course Josef Gstoettenmayr couldn´t be left out so another thirteen new routes from him as well! Info and photos courtesy of Aris Theoderopoulos, corrected by myself. 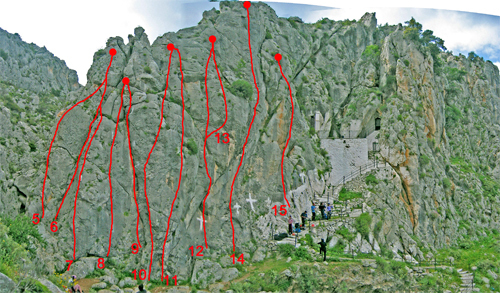 I hope the route names are right! Climbing in this area is currently banned by the City of Naplion. Another year has gone by and once again Joseph and Aris amongst others have been busy with another 30 to 40 routes here! Info courtesy of Aris Theodoropoulos and Joseph Gstoettenmayr. can see Arvanitia beach and Orestis”, “Pagkaki”, and “Apsida” sectors. for five years before it was moved to Athens. shops and the many bars and restaurants. for Tripoli and turn left at the junction to Argos to Naplion. and some great sectors such as NERAKI appeared. pedestrian zone - to the right while facingthe sea. 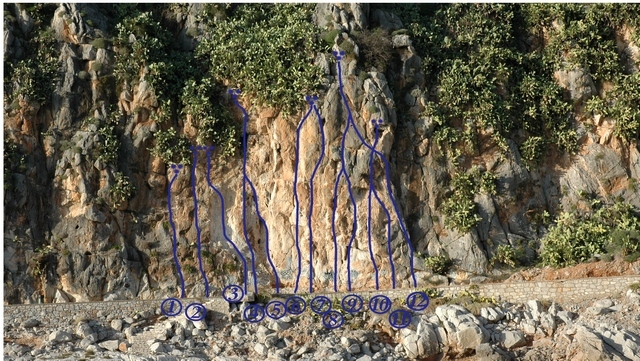 At the about 100m long you meetSector “Orestis”, just 10m after is“Pagkaki”, then before the rock arch youwill find “Apsida”, and down of the smallchurch of Panagitsa, just before the small pharos (lighthouse).If you walk on the other side, following thepedestrian dirt road again parallel to sea,after 12-13min and while youpassed a lotof superb undeveloped steep cliffs you will meet first the unnamed route of JimTitt on a sharp-grey slab at the point that the road is very close to the sea. Then you will pass the small cape and you will see the great “Neraki” sector. Panagitsa. Total 5-10 min from the car-parking. Orientation: South, on the shade only early morning. 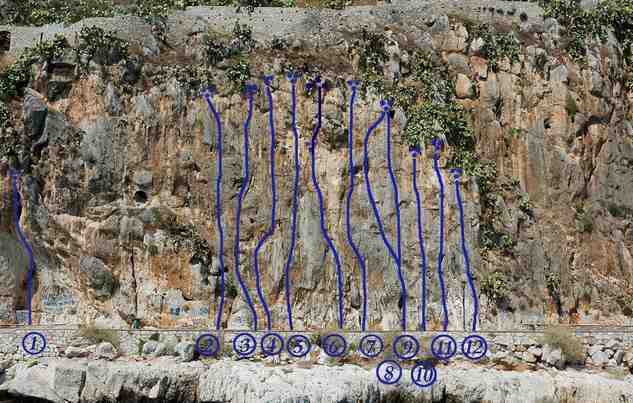 Note that these routes due for rebolting because of old and rusted bolts. 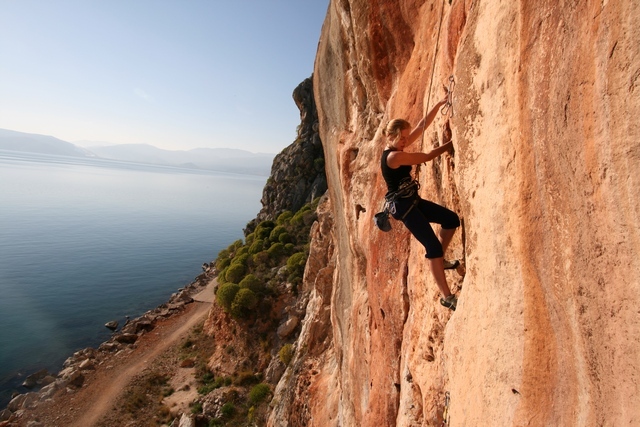 PHOTO: Climbing Apsida» 5c+ above the pedestrian zone. 2 New hard projects just left of Tonsai. 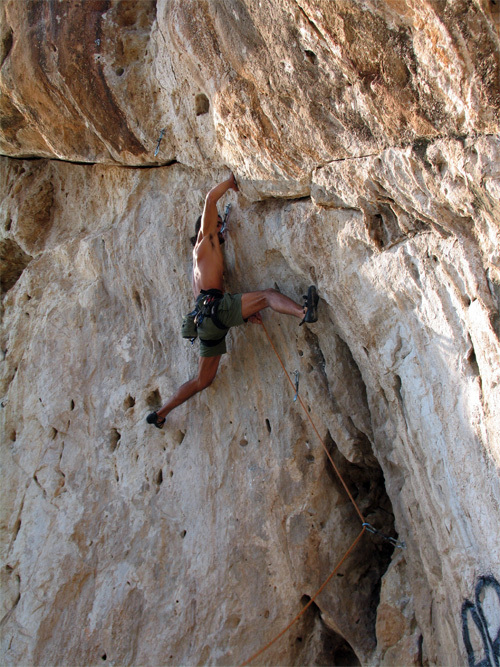 Gstoettenmayr (Austria) with the help of local climbers, especially Aris Georgopoulos. 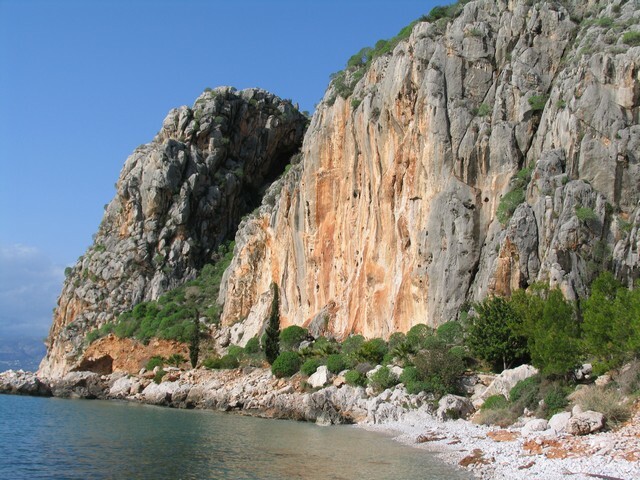 On the romantic pedestrian zone, 100m long from the Arvanitia beach parking look for the red steep rock. rebolting because of old and rusted bolts. Orientation: Southeast, in the shade in the afternoon. 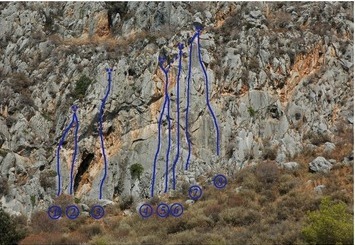 stelneis” (You send me) 6c at Neraki sector. orange color cliff with big pockets and holes. 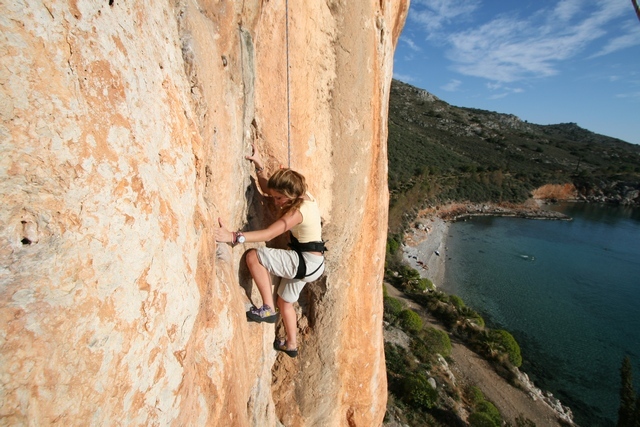 First ascents of Ape by Jim Titt and Inge Zaczek. 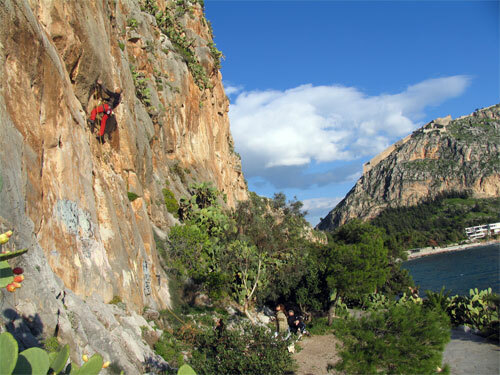 then an obvious 50m red-orange rock wall. Alternatively park at the barrier at the N end of Karathona Bay ,also 15 min walk. 7. 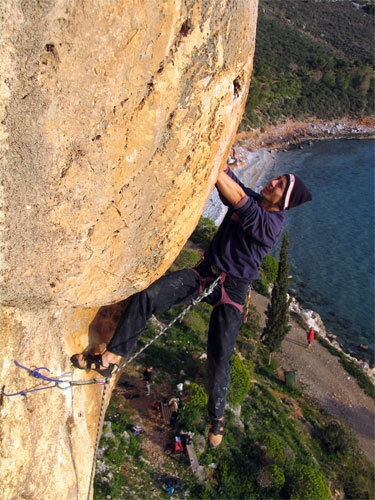 Mr. Snape extension - 6c+ 33m ***60m rope is just OK! 22. Laoura - 5c 17m *. Josef Gstoettenmayr at September 2006. 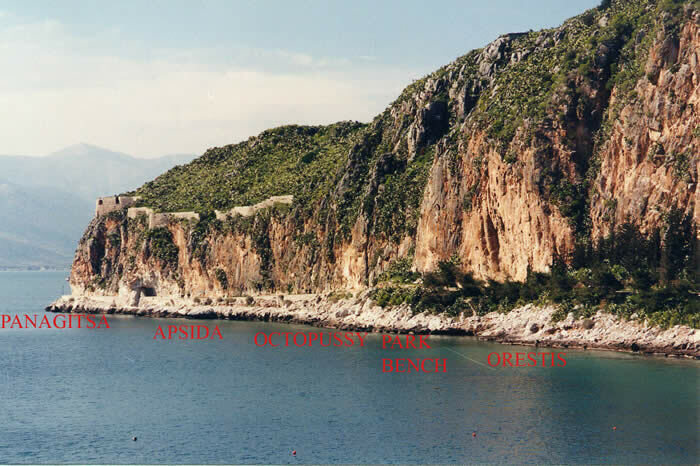 A bay lying just south of Naplion, long beach, beach bars and a taverna. A popular bathing destination. Originally planned as a holiday resort but the development has been halted. the right to the castle continue along the road to the bay. At the moment there are two cliffs climbed on. Anatoli lies to the east. As you descend into the bay take the first road right 200m to the cliff. Dimitris Mauropoulos and Antonis Antonopoulos. small chapel about 2/3 around the bay. Dimitri Stathakos and Angela Papadimitropoulou.